Apart from 3.5mm Aux/RCA connection, the audio Bluetooth adapter also supports optical cable input and output. SPIDF (Digital audio port): To transfer digital stereo audio. AUX (Analog audio port): To transfer analog stereo audio. NOTE: Please make sure you have turned the switch to SPIDF or AUX mode after power BT-07 off, then wait for about 5 seconds to turn BT-07 on again to enjoy smart life. 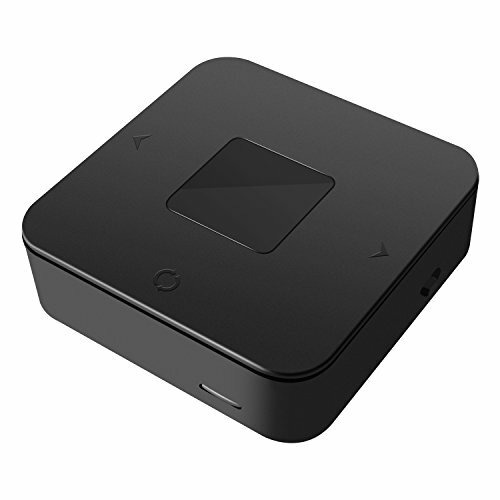 【Bluetooth 4.1 Transmitter + Receiver】 Transmitter function transforms non-Bluetooth 3.5mm audio jack devices(desktop/TV/MP3/MP4) into a wireless ones; Receiver function will receive your favorite music from phone or iPad, let car or home audio play streaming audio. 【Perfect Control Design】 Designed with independent volume "+/-" button to have a perfect control of voice up/down & next/previous track, or you may adjust your volume via your receiving or transmitting terminals. 【Always Ready】 Built with 450mAh rechargeable battery, this device can be used up to 19 hours after fully charged for 2 hours. Supports charging and streaming simultaneously. Note: You need to reset the adapter to enjoy play while charging. View More In Stereo System Components.